A lot of life circumstances can seem overwhelming sometimes. Illness, job security, physical moves, day-to-day responsibilities and I am sure we can all fill in our own blanks. I have found myself struggling with a bit of anxiety lately. I seem to muddle through fine and then, ahem, a certain hormonal time of month will come and I am washed in a sea of strong feelings and fears. You don’t have to be a girl to relate to feelings of anxiety, stress, and feeling overwhelmed, but I am sure if you are of the female persuasion you can relate for sure. Or fear not, if you can’t, some day one month you will, I am confident! I am normally a sure-footed, confident kind of gal so the way I have been periodically feeling has been a struggle. I hit a point where I frantically want to run from my feelings. I think we all do this in different ways and for different reasons run from the out-of-control feeling. We call it shopping therapy or man caves or forty more pounds from over-eating. Maybe over-exercising or zoning for hours in front of mindless TV. Maybe we overcommit to activities outside our home or stay at the office just a little later than needed. I find myself tired of running. Tired of fighting the emotions I don’t like and want to control. So I have been seeking rest and methods of relaxation. I am a Christian, so for me God, His Word and prayer have been a major part of my arsenal in my fight. But I also have been searching for practical ways to bring down my heightened state of emotional angst. Oranges. 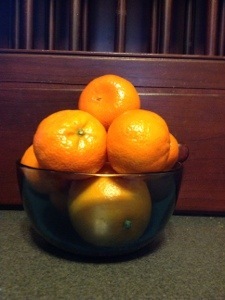 I found several articles that oranges have a calming effect and can be a relaxant. So being the doer and fighter I am, off to the grocery store I went. Go ahead and picture it. Me walking around local grocery stores everywhere in search of the perfect orange. Trying to secretly discern from the outside what kind of juicy therapy awaited me on the inside. So many to choose from: naval oranges, clementines, tangelos, cara caras, tangerines and the list goes on and on. I have tried them all during this season of my life. I think I have pretty much decided the smaller ones pack the most aromatic punch. And you know what? They do help. Is it the act of peeling the skin? The breaking through the tough outer layer and little by little pulling back the shell? Is it the fresh, alive, almost fizzing scent that permeates up through your olfactory nerve and travels to your brain and says relax!? Is it the way the strong calming odor clings to the inside of the outer layer, showing how strong it really is deep down? I am sure it is some of the above reasons and many more why I take a side of oranges with my anxiety. So the next time you are stressed or feel like you just need a ten-minute break or you are hungry for an orange, step out there and join me in the quest for a relaxing whiff of orange. Go ahead – put on some music, light a lavender candle, read a book, sit in the quiet and peel your round orange fruit of choice. Maybe you will decide it works for you too and you may get bold, throwing one in your bag everywhere you go, just in case anxiety strikes waiting at the doctor’s office, right before a big test, getting ready to give a work presentation. Go ahead, you know you want to try it now. But one warning: if you go in close – and I advise that you do – to really breathe in the uplifting citrus fragrance, either check the mirror or ask a buddy to make sure you aren’t wearing your new found fruity friend’s pulp on the end of your nose.